I’ve been a fan of the GMBN YouTube channel since it started and have had many attempts to get my bike included in their Bike Vault feature. Finally it happened, and with a “Super nice” rating to boot. I had to use my secret weapon – Owen, I had a feeling his cuteness would work. It was especially apt as the theme of the show was “mountain bikers of the future”. I’ve embedded the full episode at the bottom of this post, or click here to go straight to Owen at 19m35s. The photo was taken at Kingsbury Waterpark, whilst Jen was doing Parkrun there – something we are trying to do more together – like our ride around Draycote Water last weekend. We have also got a few more family rides planned over the next few weeks. 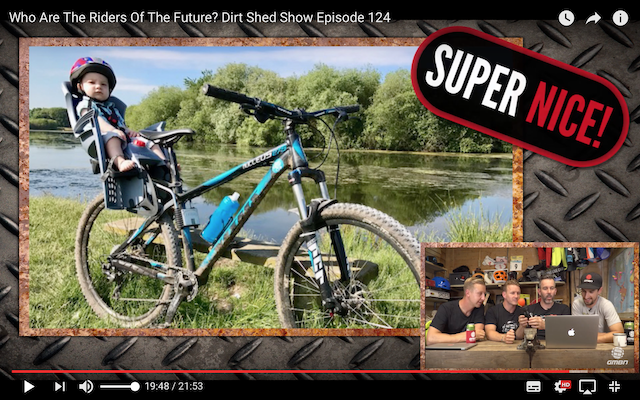 This entry was posted in Mountain biking and tagged GMBN, Kingsbury Water Park, Owen, Photo, YouTube by Lewis. Bookmark the permalink.